DISCLAIMER: If you enjoyed reading this story, please support CLAMP by purchasing the original or licensed material available in your country. Card Captor Sakura is available for purchase at CD Japan and Amazon Japan with worldwide shipping. Yue and Kero are pretty much helpless given that they can’t sense anything from the labyrinth, and they can’t help finding the exit either. Except Sakura can. Her eyes sparkle and suddenly she understands everything while being in a sort of a trance — dully noted by Yue, by the way. Sakura secures the card safely and easily (what, no battle?) and the card is called, of course, LABYRINTH. Then again, for the second time, Sakura felt that something was “off/not-right”. Syaoran then shows up and Sakura is about to invite him for dinner but oh noes, Yuna interrupts! (bad timing!) He introduces himself and Syaoran is looking all suspicious after he hears Yuna’s full name. He quickly decides he needs to go back home and call Eriol, thus refusing Sakura’s offer for dinner. Syaoran is such a good boy. Saving Sakura’s life > dinner with Sakura. Back at Syaoran’s place, we get to see a really interesting talk between him and Eriol about a Magician Society from the United Kingdom, in which the highest magician gets a “D” title attached to their name — which means Yuna could be the highest Magician from such Society. But it’s probably not the same Fye from Tsubasa, since I’m pretty sure that the “D” stood for something else in Tsubasa (can’t remember what). But we could soon be seeing Fye from this world. I’m very curious to learn more about this Society — like, who are the other members? Being in England doing nothing, I really hope Eriol does some research about it and let Syaoran know. So apparently Yuna has powers that Sakura can’t sense… because his powers are supposedly drawn from the Moon. I think that’s strange considering we are to assume that Sakura is really really powerful. Exactly how powerful she is if she can’t sense Yuna’s power? Unless he is currently more powerful than her (enough to conceal his powers?) and she is on the road to become the world’s greatest magician but she’s not there yet? I’m a little confused. And of coooooourse Yuna didn’t rent Clow’s former house just by chance — did anyone ever think that? I guess only the sweet naïve readers of Nakayoshi. We’ve got a short chapter this time: 26 pages (so short!) — 55 pages for volume 4 so far. Before wrapping up, I’d just like to add that this chapter was beautifully drawn. Short, but beautiful. Next chapter will be out next month! Oh, so it’s not that the new girl who is suspicious, but the “caretaker” of her who is subpicious… interesting. LOL! The flowers never lie. He should be a good person, then. a short yet extremely plot driven chapter! and stunning art too! im liking the new direction for sakura in that it’s not related to Clow Reed. so moon based eh? probably why yue and syaoran are quick to notice things. nice to see sakura in trance mode… what caused that i wonder? and i had no idea sakura is somewhat immune (…? if thats even the right word for it?) to moon based magic… kinda like how she is with ghosts? wow! “D” Is such a strong and interesting plot device to add fye into the story….tsubasa fye or not… id welcome either. im DYING to see fye in full on magician mode and not holding back anymore! lastly how nice to have that surprise of what the chapter has in store rather than flicking through spoilers! which im an absolute sucker for! The thing with Sakura being immune (?) to moon power is indeed strange… it kind of affects the sense that we have that she is the most powerful magician there is (?). I’m glad you enjoyed the chapter more for not having seen the spoilers! Maybe for some reason, there are going to be as many Clear Cards as Sakura/Clow Cards? (=19) To be seen in the upcoming chapters! But the important thing here, is that while we get slice of life moments which I very much enjoy and some revelations here and there too, I personally feel we are still standing at the starting point and that the story has yet to begin, even though we already reached the 15th chapter (2d chapter of volume 4). Now, THE discussion between Syaoran and Eriol which many of us were wishing for happened, but it ended up being quite different from what we had in mind, that’s for sure: we were expecting some enlightenment about the Clear Cards (which is what it seems those two know) but ended faced with a whole new issue > Syaoran met Yuna, and sensed Moon Magic from him, something Sakura didn’t feel?!! I concur with you that it is really exciting: it might sound cliché, the whole “secretive Magician Society”, but I feel so thrilled about it! 😀 And this is indeed the first time CLAMP used this plotline! Yet another element has been added to the plot, and I like it! Now, we need to wait and see if Yuna will indeed be an enemy or a friend? In chapter 14, he asked Akiho if Sakura liked her (or something along these lines) and seemed pleased when he heard she did… did he have good intentions when he inquired about it? Was he glad Sakura seemed to be fooled and unaware of what was going on so far? Or did he maybe hope to accomplish something by making Sakura and Akiho become friendly with each other for some unknown purpose? About Sakura being the most powerful in the World, I’m not too sure if we are supposed to still follow up on that word for word: she surpassed Clow Reed, that’s a FACT. Clow was supposedly the most powerful magician in the World when he was alive, but what after he vanished? What about people he is not aware of like the magicians of that Secret Society? And did CLAMP simply went back on their words after all the characters they created in both TRC and xxxHolic and all the many people with great powers they brought to life who live in many different dimensions? -she didn’t receive a proper education in Magic, she opened the book when she was already 9 at the time, and all she did is using her wits and instinct to capture them. -even after she became the mistress of the cards, she simply went back to her everyday life as a primary school student and left her magical life aside until new events happened (Clear Cards) = no training whatsover nor interest in any way to learn something new. A stand still. Which is not bad, she is still a child and should live out her childhood in peace! All in all, grown adults dedicated to Magic would probably know more spells and techniques, they might also have enchanted weapons or special skills: could Sakura really overpower them with raw powers and her instincts alone? She might indeed be more powerful than them, but now know how to fully and effectively exploit her talents. That’s what I think too. She is securing them in an extremely fast fashion. Not sure if it’s going to be *just* the beginning, but more like half? I still think it’s going to be 6+6 volumes. I bet that’s exactly what Ohkawa wants us to think XD I was having this convo with Cinzia and I think, ultimately, CCS shall retain its purity and innocent reputation in which there is no evil. It’s almost like Sakura Kinomoto has a perpetual spell within her that repels all evil. I kind like the idea of CLAMP writing about so-called villains only to reveal that they were never villains in the first place. And regarding Sakura being “the most powerful Witch”, I see what you mean and I agree with you. It’s like she has the *potential* but she’s not quite there yet. Like, is she even more powerful than Yuuko? I think she has great potential, but yes, she might be still a little too young but her place at the “Most Powerful Witch” chair is secured. This secret magician society in the UK sounds like the masons! masons are a group of people who have secret meetings and wear special robes. You can tell a mason from his handshake apparently. I’m very curious about that and finding out WHO are they. This chapter was almost everything I’ve been wanting from the Clear Card arc so far, ahaha! We know Sakura intuitively sensed moon magic in the past, since she felt floaty and happy around people like Yukito and Kaho. She seems to have experienced the same feelings around Yuna, so maybe Syaoran just doesn’t know that Sakura has picked up on something. Given how trusting she is, I’m sure she isn’t aware of anything yet, either. Otherwise…could it be the case that Sakura is such a powerful “star,” she can’t notice all the little “moons” around her? The “D” in Fay D. Flourite’s name was indeed a reference to his magical power, yeah. I don’t recall where Fay got that title, though, so isn’t there a chance that it came from Feiwang Reed, filtered through King Ashura? I wouldn’t be shocked if FWR was the head of this society, and this whole weird plan with Yuna was connected to his desire to surpass Clow Reed. (Note the bat-like uniforms, too.) It would make a lot more sense to put him in the story than Fay, who would be pretty irrelevant to CCS. I’m going to disagree with Sherry here and say that I’m now pretty sure we’re on track to finish in six volumes like the last two arcs. The plot beats are happening almost exactly on the same schedule as the Sakura Card arc: Sakura has 11 – 12 cards on hand, she’s finally wising up to the fact that something is going on, and there’s just been a giant revelation throwing the rest of the story in a different light. This whole thing with the Magicians’ Society is like Clow’s death scene in the middle of Vol. 9 — it doesn’t actually answer our questions, but it’s definitely pointed us in the right direction. 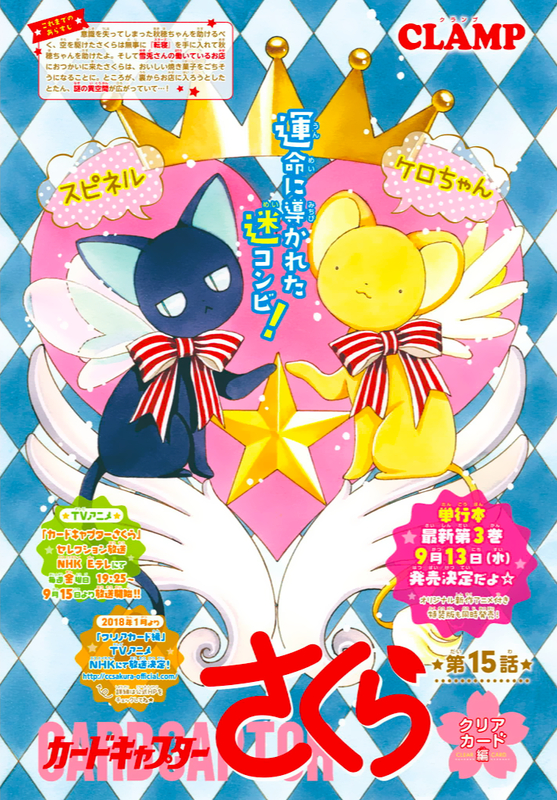 I could see CLAMP using the Clear Card arc as a springboard toward another six-volume series, if they really wanted to spend two more years on this anniversary project, but we’re probably set to get a climax in Vol. 5, 1-2 chapters of heavy exposition, and then the falling action sometime during Vol. 6. Yes indeed. Did Clow know about this Society? Did it exist already when Clow was alive, or was it created after he passed away? I hope Eriol will do his research since he is “at the field”. Otherwise…could it be the case that Sakura is such a powerful “star,” she can’t notice all the little “moons” around her? But that’s just… weird to me. The whole sun/moon/star business lacks proper explanation. Oh, so the “D” in Fye’s name stood for that too? I didn’t remember ^^” That’s a nice theory about FWR, but while the symbol in the magicians’ cloaks does look like wings, the shade is not as dark as FWR. Still, it could be a variation of some sort. Agreed. I think it will be 6+6. The structure so far looks very much like the original series. I think the TV anime will gives a clue of how long the series will be (the manga will last as long as the TV anime does). following what panicle has said here, i read an awesome theory on facebook where someone said something very similar. the theroy was that fei wong reed is/was behind this secret society. and that this secret society have clows magical tools thanks to fei wong. using these tools they created the clear cards, basing them on the clow cards, but they have no way of sealing them, and so enter sakura. they are using sakura to do their dirty work. Sakura knowing where the exit was is similar in that scene in Tsubasa Chronicles when TRC Sakura knew when the water would come up during the race in PIffle World. Kero and Yue are being useful this time, if only to sit test the magic. But Sakura is definitely getting how to work with this kind of magic, she feels the cards and can’t feel the weak spots in the magic. A new Card, LABYRINTH. She has 11 cards, at the third chapter of the fourth book, she had 14 in the Clow Card series and 12 in the Sakura Card series, s just a bit behind.